Sheree of Sheree's Alchemy is hosting a great giveaway on her blog. She's got a huge box of Amy Butler scraps and a cute Amy Butler pattern. Comments close today, so you better hurry! I read Sheree at Bloglines, but I somehow missed her giveway post last week. Bloglines is a little undependable sometimes. Good luck to everyone that commented though! 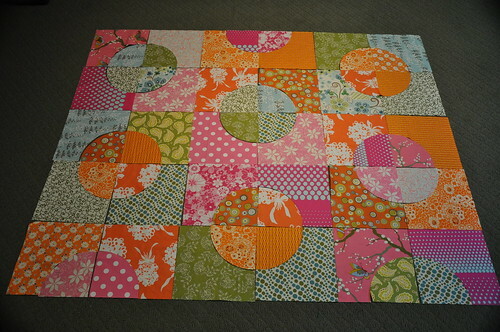 I laid out my fabrics for the Roundabout quilt from the quilt-along. I knew the fabrics were bright, but wow. It's starting to grow on me. The more I look at it, the more I like it.